PORTLAND: The biggest lobster ever caught in Maine, a 27-pounder (12.25 kg) nicknamed "Rocky" with claws tough enough to snap a man's arm, was released back into the ocean after being trapped in a shrimp net last week, marine officials said. The 40-inch (one-meter) male crustacean, about the size of a 3-year-old child, was freed in the waters of the Atlantic Ocean, said Elaine Jones, education director for the state's Department of Marine Resources. "All the weight is in the claws," Jones said. "It would break your arm." 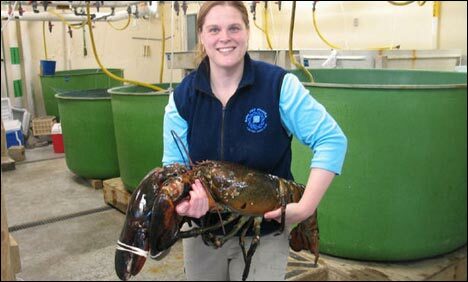 The lobster was caught near the seaside village of Cushing and brought to the Maine State Aquarium in West Boothbay. The state restricts fishermen from keeping lobsters that measure more than 5 inches from the eye to the start of the tail. Because he became acclimated to the water near the aquarium, the lobster was released in West Boothbay rather than where he was caught. Scientists are unable to accurately estimate the age of lobsters of this size, said Jones. The marine lab has no record of a larger lobster being caught in the state, she said. The world's largest recorded lobster was a 44-pounder (20-kg) caught off Nova Scotia in 1977, according to the Guinness Book of World Records.